When builders Arash Askarian and his wife Sherry, of Noura Homes, first found the property on Leyland Street in West Vancouver where they would design and build an ultra-modern, chic abode, it was inhabited by a neglected home overrun by the underbrush and vegetation surrounding it. Q: How would you describe the home’s style? A: This home is definitely modern. When conceptualizing the design, we concentrated on blending clean lines with extensive use of concrete and glass, giving it a West Coast modern feel that really capitalized on the view. Q: The home is absolutely stunning. What was the motivation for its overall style? A:We live in West Vancouver, which is a beautiful city with unbelievable ocean and mountain views, lush greenery, and it’s one of the few places in the world where you can go skiing or snowboarding, then head to the beach. 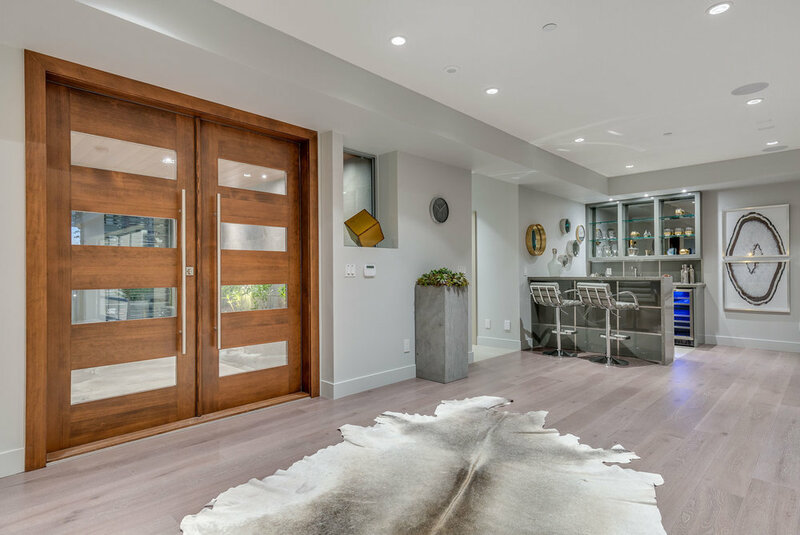 We wanted this home to celebrate the diverse landscape of West Vancouver, as well as the city’s modern tradition. So, when we designed it, we included multiple rain shower heads, an infinity hot tub and windows that strategically framed views of the water to showcase the ocean view. 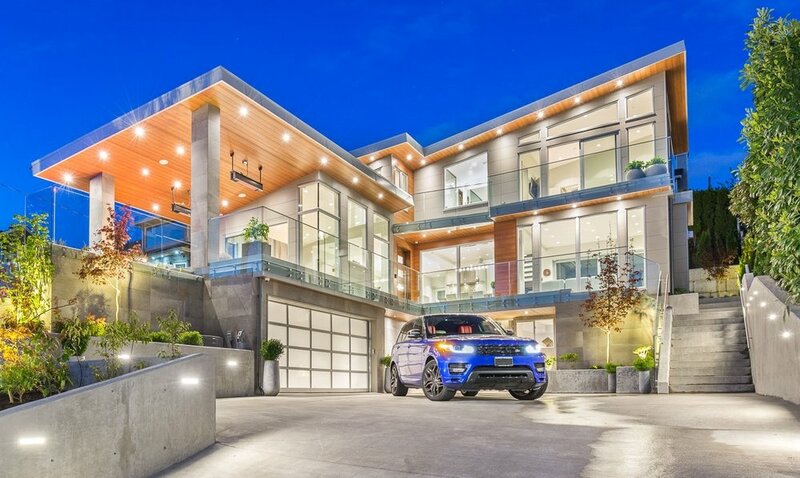 The home’s concrete finish and sweeping use of glass paid tribute Vancouver’s modern style. These elements, combined with others, helped us achieve a look that lives in harmony with the environment that surrounds it and encourages you to feel one with nature. Q: Why did you decide to go with modern-inspired architecture over other styles? Q: What makes a home modern or defines modern style? A: In the case of this home, its modern style really comes together through the combination of clean lines, clean spaces, lots of glass and concrete. These elements create a sleek, refined look that allows natural light to flow throughout the home, highlighting the minimalist design and surrounding lush landscape. Q: As the home’s builder, you were clearly involved with the home’s ultimate look, Arash. How involved were you with the design of the home? A: We were very involved, actually. Beyond the actual construction of the home and choosing the materials for it, the modern aesthetic was my vision. I had very strong idea of the story that I wanted this home to tell with its design. Q: What are some of your favorite modern design accents (interior or exterior)? A: One of our favorite aspects of the home is the use of a single material. We really loved the sleek look of Nichiha’s IndustrialBlock. Where a lot of homes use multiple materials to create visual interest, IndustrialBlock’s smooth finish, when paired with glass and wood accents, creates a look that’s very soothing to the eye and tranquil. Of course, the infinity hot tub is a great way to relax and take in the surrounding view. Q: What does it mean to be a modern homeowner? A: Owning a modern home is like removing a barrier between you, the homeowner, and the natural landscape surrounding the home. It’s not about building a refuge from the environment, it’s about creating a space that integrates with it. Q: Why did you decide to use Nichiha on this project? A: As a builder, our number one priority is to build not only beautiful homes but homes that will last. Quality is our top consideration, and we are always searching for materials that are unique, beautiful and, more importantly, long lasting. Nichiha checked all of these boxes. Although the initial price point was slightly higher than other materials, you are truly investing in a quality product that won’t crack or rot, and is truly low-maintenance. Q: What was your experience with Nichiha during the construction phase of the project? A: We had a great experience. We partnered with Steve at First Class Finishing to install the Nichiha siding. Since this was a first installation for both of us, we reached out to our Nichiha rep, who was incredibly helpful in explaining the process. Overall, the install was simple. Once we installed a few panels, you could really just click and go. Q: Are you satisfied with Nichiha’s performance and the look it added to the project? A: Absolutely. The look is incredible and distinct, not generic like other fiber cement or vinyl brands. In fact, everyone who’s seen the house loves it. Once we explain the product to them - how it works and the minimal maintenance required - they are even more impressed.